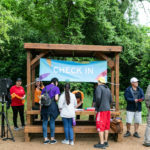 Austin has always been a colorful city that attracts artists from around the world. Every Month Miller IDS showcases Austin’s creative energy by highlighting a resident artist and their work. We love being a trusted resource for painters, illustrators, designers, and visual artists and, in turn, show our gratitude to the talented folks that keep returning for the highest-quality prints in the city. August 2016: Our August artist, Heidi Miller Lowell, is a long-time Austin resident. First teaching in our public schools, she then launched the town’s beloved Artery, (http://www.heidimillerlowell.com/classes-workshops/), which offers an art collective, summer camp and provides nursing home classes in art. The Artery’s goal is “for each artist to come away from each lesson with a sense of joy and desire to create more art“. Heidi’s extensive reading of current brain research has informed the Artery’s teaching philosophy, believing that just as stress makes brain waves more active and agitated, art calms them. The school concentrates on product over process and goes out to many of the area’s elder care homes regularly. Heidi feels art is an expression of being alive; its creation is an outlet for all the joy, hope, sadness and love in one’s heart. Though she has used multiple media, watercolors are her favorite medium at this time; watercolors require that you release some control, which she finds meditative. She paints whatever inspires her, often from nature. 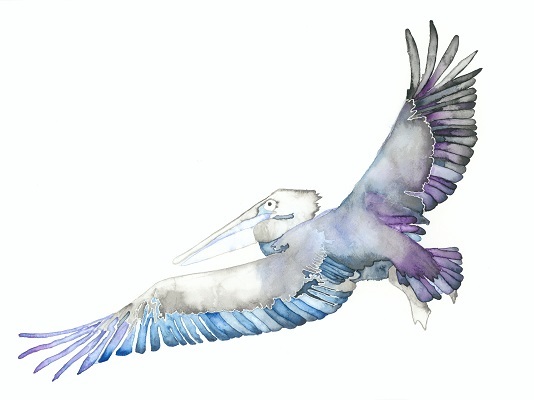 “Pelican”, featured here is a delicately beautiful rendering of the bird, whose meaning as a spirit animal connotes confidence and calm. Printing this and other works at Miller IDS, Heidi enjoys coming in as she feels “everyone is so nice, down to earth and friendly – very Austin! – and Dana has been so helpful with my prints”. 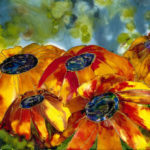 More of Heidi’s work may be enjoyed at the artery, http://www.heidimillerlowell.com/shop-2/.